Press 2 shields left and right. Move the stick to the left and right wheels, then pull the stick down in sequence: Right 2 times, left 1 time, right 1 time, left 2 times, and right 1 time. Press the barrel on the table and use the hammer to hit the tip of the iron wire 4 times. Pull the iron wire to the left 4 times. Arrange the order of stairs. 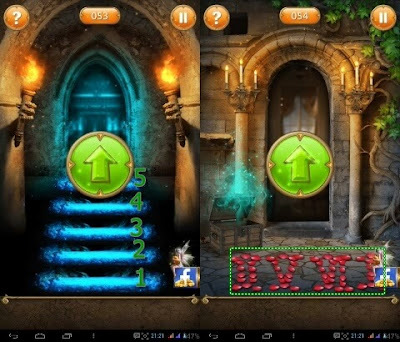 Drag the black staircase (3> 1) down, drag the blue staircase (4> 2)) down, and drag the light blue ladder (5> 4) down. Tilt to the left and right of your phone so that you will see Roman numerals on the floor. Press the numbered circle in the crate then hit the number 2561. Tap the box on the door and arrange the order of the flower color. The sequence of colors from the outside: green, light green, blue, pink, pink, and red. 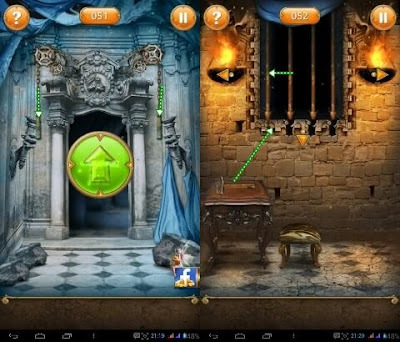 © Escape Game All Level Walkthrough. All Right Reserved.